All types of drive belts supplied: V, flat, round (leather & plastic), link, variable-speed, poly-V, etc. For immediate delivery or straightforward advice about any belt (no order too small) feel free to call us. 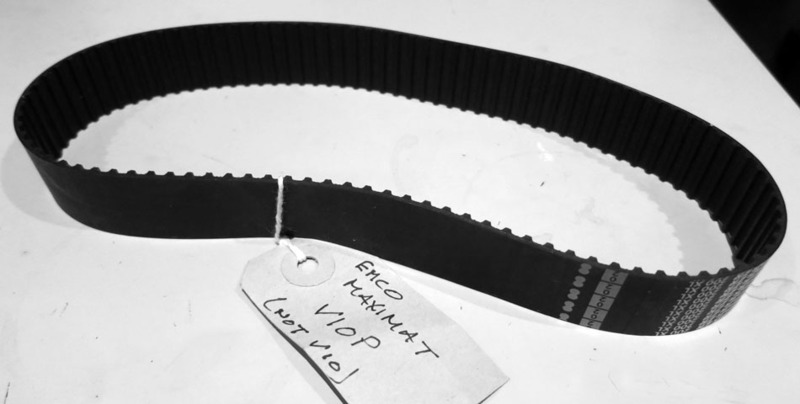 We also stock miniature V-belts (6 & 8mm top widths) and the special belts for: Axminster 918, Warco 918 (and similar developed copies of the Emco Compact 8), Naerok and Seeley bandsaws, etc. Belts also stocked or made for a variety of popular Lathes & Millers: Myford, Boxford, Emco, Unimat, Axminster, Warco, Colchester, Harrison etc. 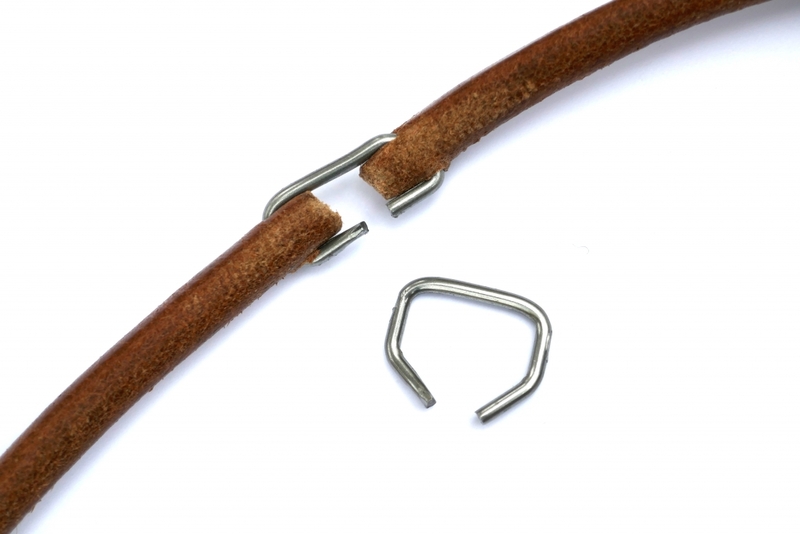 Advice on how to ensure that you order the correct length of flat belting can be found here. We can make several types of belt to your specifications, and these can be supplied joined or you can join them yourself on the machine. Follow the links below for more information. This is the superior replacement for the original "Brammer" black-fabric "round-end" link-belting that was held together with mushroom-headed metal pins each (usually) stamped with a letter "B". The new belts have only a slight curve to the end of each link and the head of the pins are now "T" section. The ideal installation for any machine tool is an endless Betalon-Multiply belt; these are light in weight but immensely strong and stretch resistant. They absorb shock loads well, have a high coefficient of friction, enjoy a proven record of reliable industrial service and can be made in almost any combination of length and width. 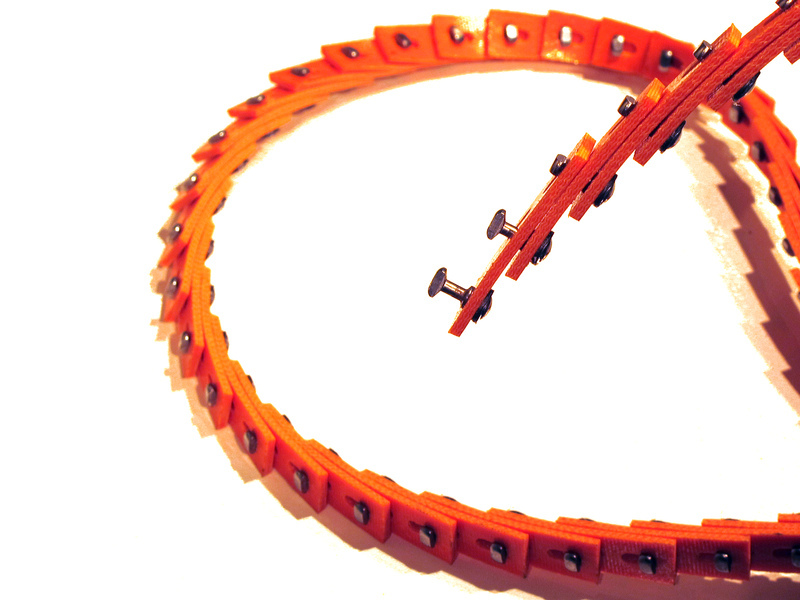 A new development of an old idea - a link belt without metal fasteners. This is highly effective on all lighter machine tools and especially useful on precision lathes and millers where a "softer" drive, free from vibration, is appropriate. This belt (unlike cheaper alternatives cut from conveyor belts) is enormously strong, densely woven and specially designed for machine-tool use. This makes an excellent, long-life application for hard-worked machines - from models though engravers to small lathes and millers, etc. Our solid plastic belting is made in Switzerland and of the very best quality. We can produce belts of practically any length down to 140 mm long using a jigged joint and heat weld. This makes an excellent, long-life application for hard-working machines. Our plastic belting is of the very best quality and is made in Switzerland. 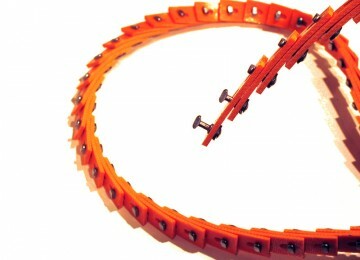 Hollow belts are easy to fit without dismantling the machine or having to melt the ends of the belt together. Early lathes, light-duty milling machines, drills, Singer and other makes of sewing machine and assorted power tools were often driven by a round leather belt, sometimes referred to in contemporary literature as a "gut" drive. This type of belting is also used in furniture and similar products. It is still available and usually in stock for immediate delivery. The belt colour is actually a light tan - and far lighter than shown in the photograph. Please note: the stated diameter of the material is nominal i.e. the measurement might be a little under or over the given figure. 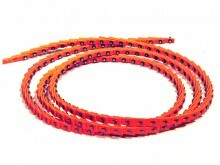 Mini V-belts, 8 mm across the top surface - as used on a wide variety of small machine-tool and in other applications. Often hard to find - we aim to keep stock of all the sizes listed. We can also make belts for all cycling machines. Phone: 01298-871633 from 09:00 to 21:00 for advice. Emco Compact 8 lathe. Narrow V-belt. 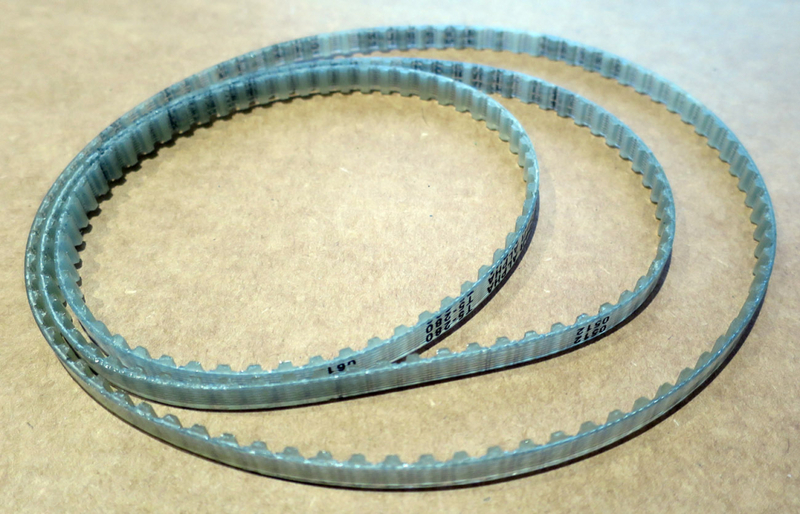 The correct variable-speed drive belt for the Raglan "5-inch Lathe" . These belts are high-quality, industrial-grade belts made in Europe. The earlier "Little John" lathe belt is different and listed separately here.. An installation tip: The manual suggests swivelling the layshaft housing about bolt 'D'. Round drive belt for the small but popular Naerok, NuTools, Warco, Seeley and Multico branded bandsaws. We have determined that the Naerok and NuTools versions had a belt made from 7 mm diameter material in the following lengths: 650, 660 and 680 mm. However, it's important to check the length you need carefully and tick the right box. Please take care to measure the belt and select the appropriate length below. Link belts help to reduce the vibration normally passed from a single-phase motor to the lathe - and was a fitting often used by Myford Service engineers to "quieten" a noisy machine. On the Super 7 and ML7R, the T-link belt is highly effective on the drive from motor to countershaft. The only PowerTwist belt needed on the Super 7 and ML7R is from the countershaft to the headstock. The use of this belt guarantees that the lowest speed will be available as, when fitted with the metal-pin NuT-link there may not be enough room between the inner face of the headstock and the largest pulley on the main spindle. 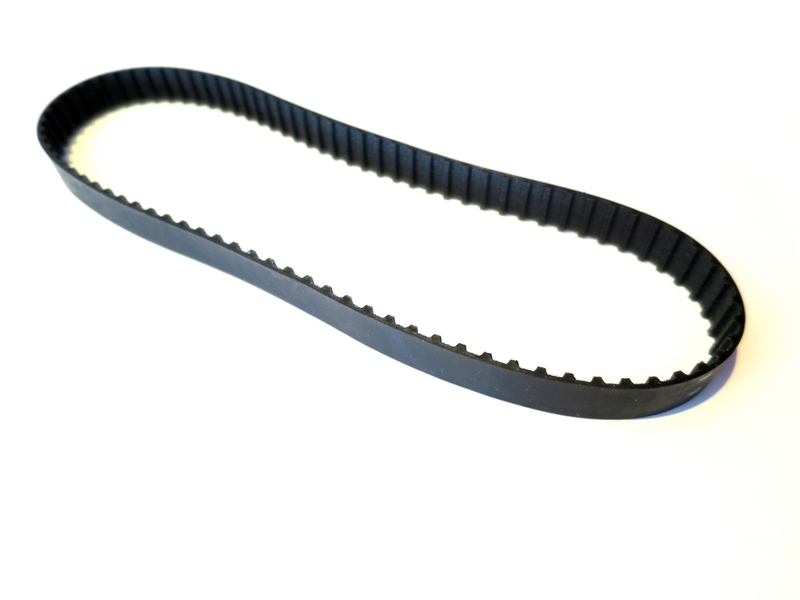 Fobco 7/8 and 10/8 Drills Drive Belt: This is a European-made, high-quality, machine-tool grade belt with an invisible joint that, unlike cheap imports, does not bump as it goes round the pulleys and ensures the smoothest possible drive. Details of Fobco drills can be found here For the Fobco Star drill belt, click here. Sold by various importers including Axminster, Chester, Warco, etc. The "920" lathe and other Model Numbers - a Chinese-made lathe. Narrow 5 mm x 710 V-belt. This is a top-quality, USA-made product. A length of clip is hammered in at each end of the belt and joined with two sections of the special oval pin supplied - these being designed to work back-to-back. Alternatively, a length of nylon or red-fibre rod can be used. A detailed instruction sheet is supplied with each clip. 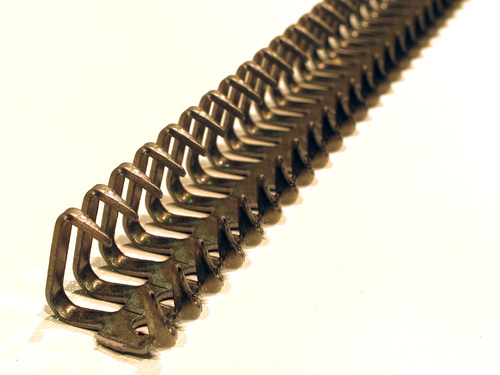 "Alligator clips" are made in various sizes but five cover most belts in common use. All clips - save for the No. 7 - are 11 inches long (the No. 7 is 6 inches long). The price shown is for a single strip complete with the special "dimpled" connecting pin. Emcomat 7 and 7L lathes: Drive belt toothed 190 XL-75 for the early machines - the belt is 3/4" (20 mm wide) PLEASE NOTE: check the width of your pulley. Late-model machines have a 1-inch wide belt - and that can be ordered here. The special belt for the headstock drive on the Tyme Avon Wood Lathe. 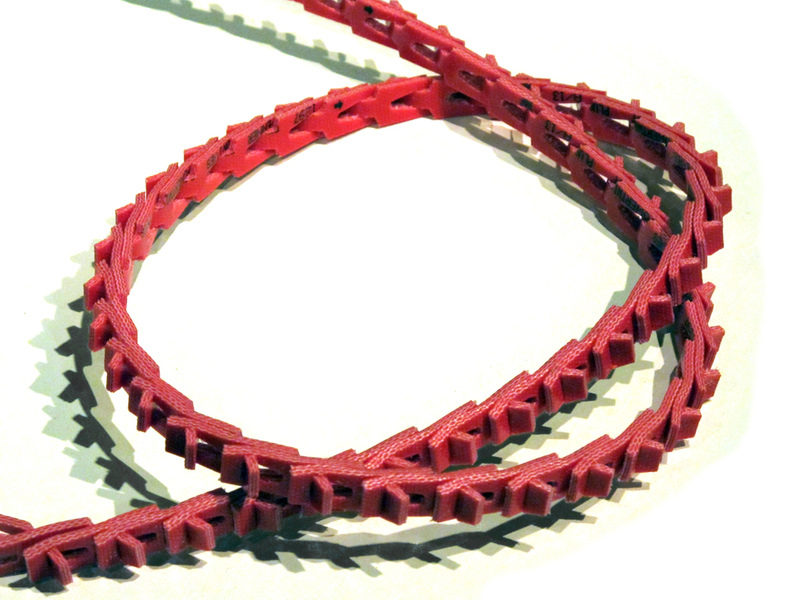 The correct variable-speed drive belt for the Little John Mk.1 and Mk.2 Models. These belts are high-quality, industrial-grade belts made in Europe. The later "Raglan 5-inch" belt is different and is listed here: https://store.lathes.co.uk/node/11896/edit An installation tip: The manual suggests swivelling the layshaft housing about bolt 'D'. Tyme Cub wood-turning lathe headstock spindle drive belt. The correct high-quality drive belt for Myford Mystro wood-turning lathes. 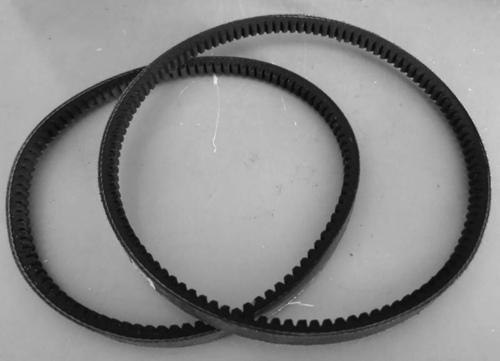 Drive belts for Boxford Lathes: All Boxford lathes T, A, B, C, AUD, BUD, CUD, TUD, ME10, etc (apart from the tiny precision types) used "A" section V-belts - and today the best replacement is the Nu-T-link Type. Fitting the belt requires care and instructions are provided. 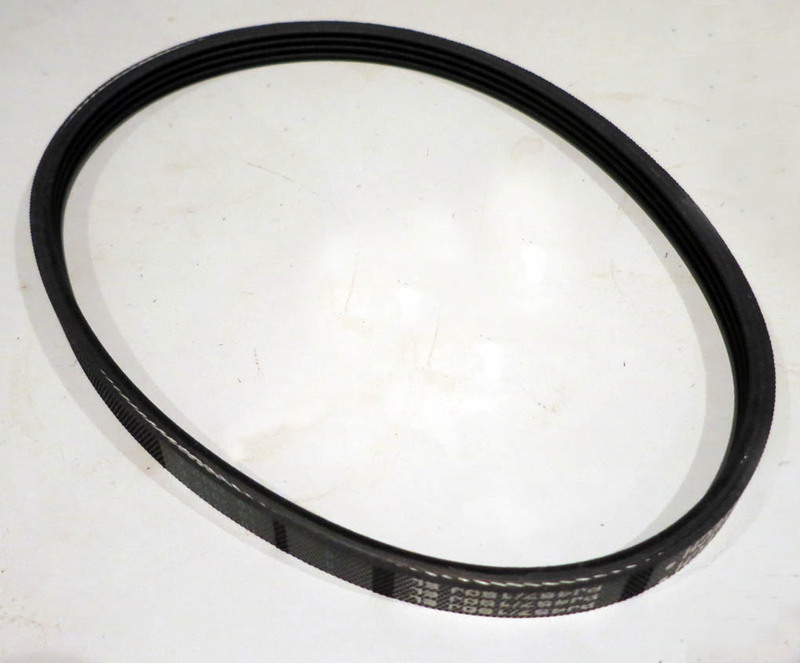 Main drive belt for the Emco V10P. 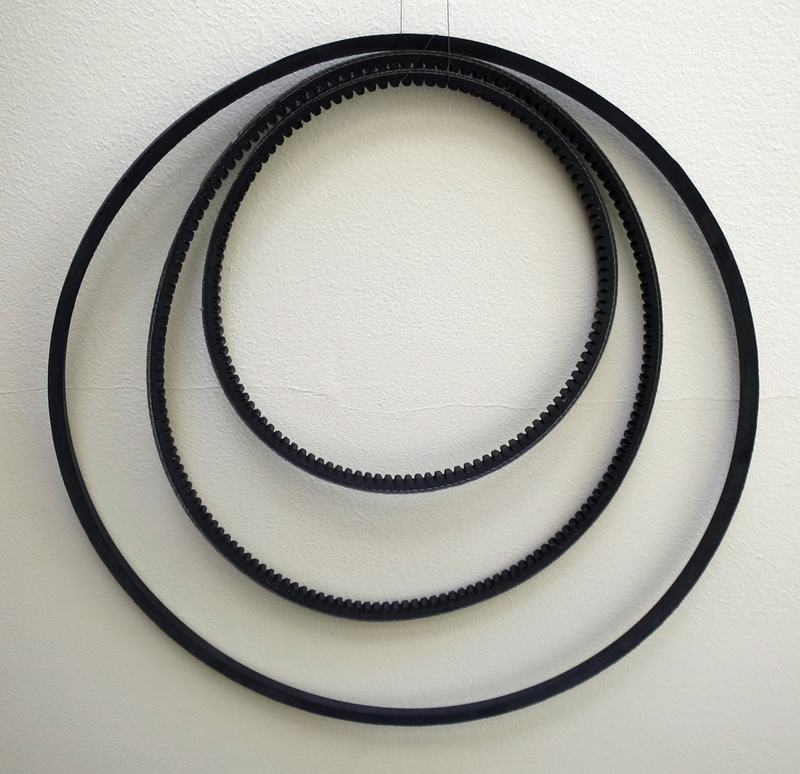 Emcomat 7, 7L, 8.4, 8.6 and V8 lathes: drive belt toothed type 1-inch wide for late-model machines. PLEASE NOTE: check the wid5th of your pulley. Early lathes had a narrower 3/4-inch (20 mm) belt - and that can be ordered here. For the more-common Kennedy "Hexacut" Model 60 hacksaw the flat belt is normally 1" (25 mm) wide and 21.8" long (554 mm) - however, because the size may have changed over the years, it would be safer to measure your machine to get an exact figure. As the belts are custom made, if you order the wrong length a refund is not possible. An accurate measurement can be taken around the pulleys with a fabric tape measure or a strip of paper stretched round, overlapped, marked and then carefully measured. For the Myford ML8 lathe the new, improved metal-pin T-link belting is ideal. It's a sectional belt so no dismantling is needed to fit it. For lathes on the maker's stand 1.2 metres is the length needed. If mounted on a home-made bench with a thick wooden top, 1.3 metres is usually sufficient. The width need is 1/2" (13 mm) in an "A" section. Click in the box below to select the length needed (the price shown below is for a belt 1.2 metres long). 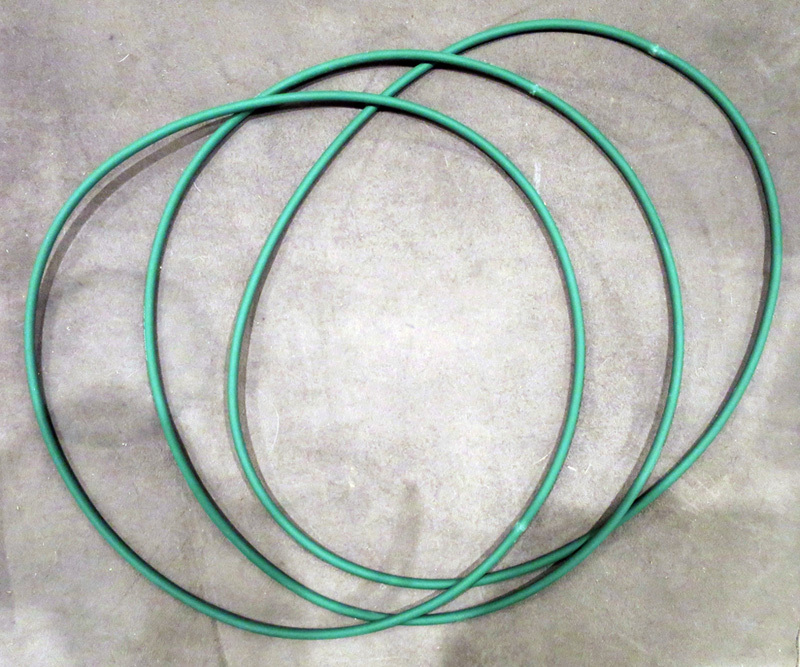 A pair of Hobbymat - Prazimat Lathe belts. Top quality, made in Germany. For smooth, vibration-free running at high speeds it is recommended that both belts be changed at the same time. Clips for round leather belts. 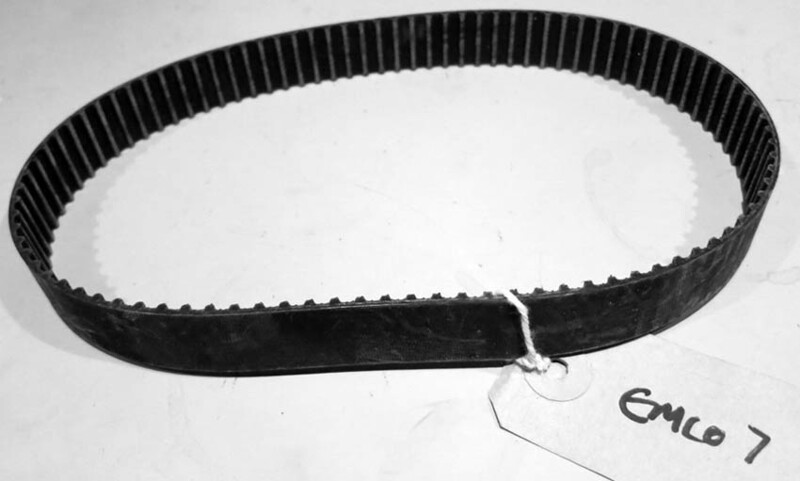 Toothed drive belt for the Emco Compact 8 lathe. 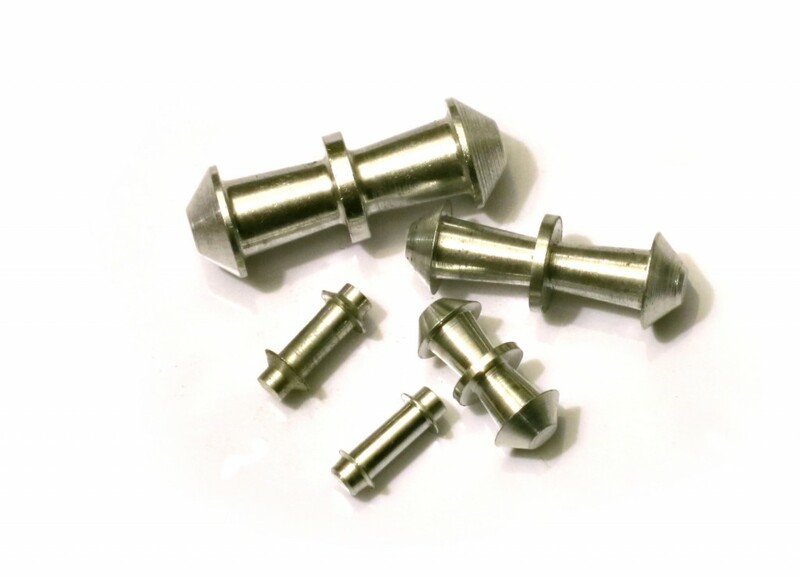 Mushroom connectors for hollow round plastic drive belts.